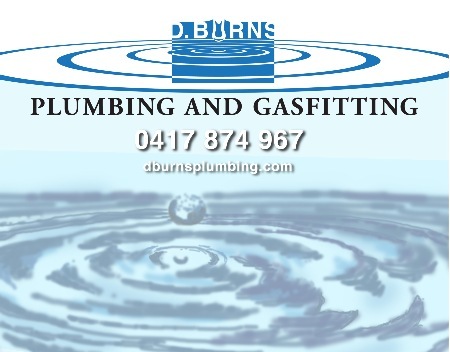 Plumber Adelaide | D Burns Plumbing and Gasfitting is a leading Adelaide Plumbing and Gasfitting company . We specialise in maintenance plumbing in the metropolitan area . Dave Burns has been involved as an Adelaide Plumber and Gasfitter in the maintenance field for seventeen years . As an up-to-date business, we want to give you the opportunity to stay in touch with our company and offers . The emphasis of our site is on providing greater service to our customers and making the choices of your options easier for you. If you are not familiar with our company and your first contact with us is online, we would be pleased to hear from you. Please let us know what your needs and questions are, we would be more than happy to help. Call Dave today - 0417874967 . Our company was established in 2005 and has been responsible for providing outstanding maintenance plumbing and gasfitting service ever since. Our specialty is in the area of providing outstanding emergency service. Our regular customers particularly value our punctuality and our great service. Our business is able to commute to our customers over all parts of the metropolitan area . We value customer service and satisfaction. We believe happy customers are the basis of our past, present and future success . We always strive to give our customers great value by providing them the highest quality products and great service at a competitive price. We encourage open communication and ideas from all our employees and customers. It is the practice and policy of us to conduct our business in an ethical and forthright manner , so that our employees and customers can always take pride and trust in our company.